Dan appeared on Colts’ Quarterback Andrew Luck’s book club podcast to discuss the creative process of Lincoln’s Last Trial: The Murder Case That Propelled Him To The Presidency. The interview details the rediscovery of the only transcript that exists of any of Abraham Lincoln’s trials. Dan discusses the importance of the trial both in terms of the presidency, as well as the future of all American court cases. The podcast looks into the historical accuracy of Dan’s newest publication, from the foundation of new legal precedents, to the smallest details of Lincoln’s everyday actions throughout the length of the trial. Dan looks back on how he creates an interesting and exciting true crime drama through careful research, development, and structure based firmly on 140-year-old facts of one of America’s most important historical figures. Lincoln’s Last Trial is the true story of Abraham Lincoln’s last murder trial, a case in which he had a deep personal involvement – and which played out in the nation’s newspapers as he began his presidential campaign. The book captures the presidential hopeful’s dramatic courtroom confrontations in vivid detail as he fights for his client – but also for his own blossoming political future. It is a moment in history that shines a light on our legal system, as in this case Lincoln fought a legal battle that remains incredibly relevant today. Dan’s interview on the Andrew Luck Book Club podcast can be found here. To get a copy of Lincoln’s Last Trial, follow this link and share your thoughts with us on Twitter using the hashtag #LincolnsLastTrial. On Thursday, March 29th at 11 PM ET, Dan’s new show, “Grace vs. Abrams” will premiere on A&E. Dan will be joined by legendary TV journalist Nancy Grace, as the two argue their sides regarding infamous crimes in front of a studio audience. Some cases they will tackle include Drew Peterson, a convicted murderer who was a suspect–though never convicted–in the 2007 disappearance of his fourth wife, Stacy Peterson, and Casey Anthony, the mother of two-year-old Caylee Anthony, who was found not guilty of Caylee’s murder in 2011. Dan and Grace will break down each case, providing an in-depth look as they discuss evidence, suspects, and trials, including interviews with key players, some of whom have never spoken about the cases until now. The two attorneys, who have been known to spar on “Good Morning America,” will provide professional, opposing view points for these compelling and fascinating cases, with each voicing their opinions as to whether or not legal justice has been served. On July 1st, Dan joined panelists Katty Kay and Michael Steele on HBO’s Real Time with Bill Maher. The panel discussed Trump’s most recent controversy; namely, his disparaging tweets of MSNBC’s Morning Joe cohosts Mika Brzezinski and Joe Scarborough. Dan pointed out that while “almost everyone” agrees that Trump’s tweets-referencing Morning Joe’s “low-rated” show and alleged cosmetic surgery of host Brzezinski “crossed a line,” he notes that what is perhaps more troubling than the now-infamous tweets are the allegations Scarborough has lodged against Trump. Scarborough claims that Trump’s advisors offered to pull an unflattering National Enquirer story about Brzezinski and Scarborough if they covered Trump’s presidency in a more positive light- a claim that Dan argues is akin to blackmail and a worse breach of presidential conduct than his tweets. 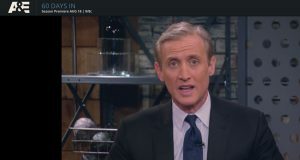 Dan Abrams reported this morning, Wednesday, July 20th on Good Morning America, that Fox News’ Megyn Kelly told investigators of “multiple incidents” of alleged harassment by network Chairman and CEO Roger Ailes. Dan was told by a source close to the investigation that multiple Fox News female talent have spoken to investigators about potential harassment by Ailes. 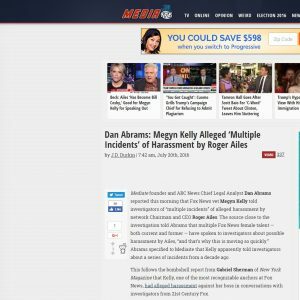 In addition to his reporting for ABC News, Dan specified to Mediaite.com that Kelly apparently told investigators about a series of incidents from a decade ago. Read the full story here. On May 26th Dan hosted A&E Network’s “60 Days In: The Aftermath”, a tell-all reunion with season 1 participants. “60 Days In” is cable’s #1 new non-fiction series returning for a 2nd season this coming August. During the reunion special all seven participants meet for the first time to discuss their experience inside and got to hear feedback from Sheriff Jamey Noel and Captain Scottie Maples. Watch the full episodes of “60 Days In” here. 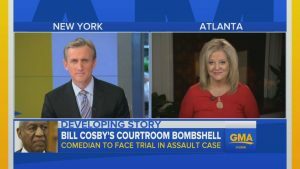 Dan ap peared on Good Morning America, alongside of HLN’s Nancy Grace, Wednesday, May 25th to discuss the latest Bill Cosby bombshell. The former TV dad will stand trial on charges that he drugged and sexually assaulted women in 2004. More than 50 women have accused Cosby of sexual assault and the prosecution is likely going to fight vigorously to try to get their testimony included in this case. Dan commented, ” The question is will they be able to testify? And if they are, this case against bill Cosby is going to be a very powerful, strong one. If they can’t, if a court deems that they cannot testify as part of this case, this is not going to be that easy a case against Bill Cosby.” Watch the full segment here. 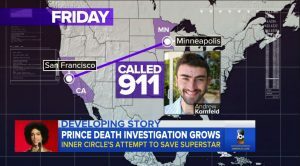 Dan appeared on Good Morning America, Thursday, May 5th to discuss the latest details on the mystery surrounding Prince’s death. The U.S. Attorney’s office and DEA are now joining the investigation as we learn more about a California doctor who says he was called to help the superstar with an addiction problem. An ABC affiliate confirmed with law enforcement that prescription drugs were found in Prince’s system and apparently the singer’s inner circle were trying to get him help. Watch the full story here. Dan appeared on Good Morning America, Wednesday, April 27th to discuss the future of Prince’s multi-million dollar estate. 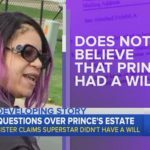 Prince’s sister has told the court that she believes Prince has no will. Dan commented, “He went through a lot of lawyers and managers over time. There might still be a will out there, but if there isn’t a will, then it’s likely going to be divided amongst the siblings equally. Half siblings and full siblings get equal access but the first thing a probate court is going to have to do appoint an executor.” Watch the full segment here.